Denver Home Styles - Gothic Revival: Denver Homes & Real Estate - Vintage Homes of Denver, Inc. Considering the cost of the materials and labor necessary to construct these buildings, they were reserved for churches, municipal buildings or the wealthy. 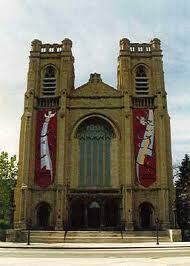 The Cathedral of the Immaculate Conception and St. John's are both strong examples of this architectural style.